(The tabled information is provided courtesy of the Nuclear Regulatory Commission). Potassium iodide is a salt, similar to table salt. Its chemical symbol is KI. It is routinely added to table salt to make it 'iodized'. 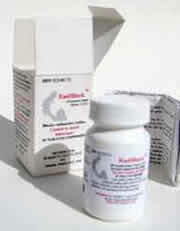 Potassium iodide,if taken in time and at the appropriate dosage, blocks the thyroid gland's uptake of radioactive iodine and thus could reduce the risk of thyroid cancers and other diseases that might otherwise be caused by exposure to radioactive iodine that could be dispersed by a terrorist activity or nuclear accident. What is the role of potassium iodide in radiological emergency preparedness? 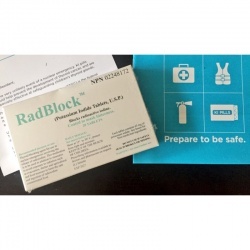 The purpose of radiological emergency preparedness is to protect people from the effects of radiation exposure after a dirty bomb or accident at a nuclear power plant. Evacuation is the most effective protective measure in the event of a radiological emergency because it protects the whole body (including the thyroid gland and other organs) from all radionuclides and all exposure pathways. However, in situations when evacuation is not feasible and in-place sheltering is substituted as an effective protective action, administering potassium iodide is a reasonable, prudent, and inexpensive supplement to evacuation and sheltering. Potassium iodide is a special kind of protective measure in that it offers very specialized protection. Potassium iodide protects the thyroid gland against internal uptake of radioiodines that may be released in the unlikely event of nuclear exposure. What is the benefit of taking potassium iodide during a radiological accident? When potassium iodide is ingested, it is taken up by the thyroid gland. In the proper dosage, and taken at the appropriate time, it will effectively saturate the thyroid gland in such a way that inhaled or ingested radioactive iodines will not be accumulated in the thyroid gland. The risk of thyroid effects is reduced. Such thyroid effects resulting from radioiodine uptakes due to inhalation or ingestion, or both, could result in acute, chronic, and delayed effects. Acute effects from high doses include thyroiditis, while chronic and delayed effects include hypothyroidism, thyroid nodules, and thyroid cancer. Can individual members of the public obtain potassium iodide? 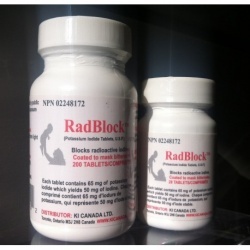 Health Canada has approved potassium iodide as an over-the-counter medication. As with any medication, individuals should check with their doctor or pharmacist before using it. What are the recommended dosages of potassium iodide?